11 secrets to keeping your joints intact! Arthritis is a musculoskeletal disorder affecting people’s lives. 1- Osteoarthritis: begins later in life, develops slowly, joints are painful but no swelling, no other symptoms in the body, joints start deformation. 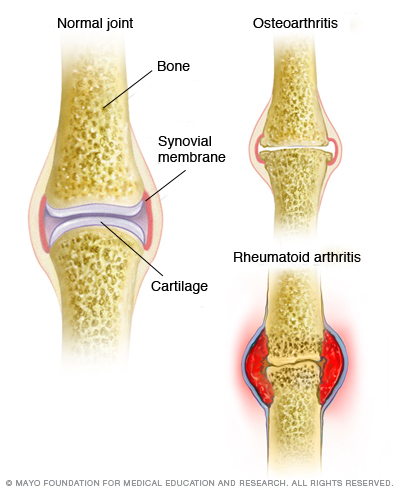 2- Rheumatoid Arthritis: can appear at any stage in life, develops rapidly, joints are swollen & painful, the person experiences overall fatigue and feeling of sickness. Mechanical wear and tear in the joints causes osteoarthritis, while rheumatoid arthritis is an auto-immune disease where the body attacks its own joints. You need to understand the difference because each one has its own symptoms and has its own different treatment. – 2 out of 3 obese people may develop osteoarthritis at any time in their lives. – Arthritis is more common among women. – An X-Ray is most probably the best way to diagnose arthritis. – Overusing or injuring a joint, can lead to a decrease in joint space and bones start rubbing on each others. Bony outgrowths can start forming, possibly leading to osteoarthritis. How to Keep your Joints Healthy and Prevent Arthritis? Arthritis is highly preventable and even if it initiated in the body, its progress can be halted. Having a healthy lifestyle is the key. 1- No for sedentary: keep your body moving. Don’t just sit at your desk or anywhere else; take a walk or do some stretching even if you are at work! 2- Wear protective gear on your elbows and knees when doing a risky sport like skating. 3- Keep your weight in the normal range. 4- Stretch often. Do not stretch cold muscles; try to warm up before to prepare your ligaments, joints and tendons. 5- High-impact exercising may lead to injuries. Try to walk instead. 6- Your joints have “exercising limits”. If your muscles are aching after an exercise, it is probably normal if it lasts up to 48 hrs. However, if it lasted longer, then you probably pushed your body too far. 7- Eat fish rick in Omega-3 like salmon. 9- Have a good posture when sitting down. Why don’t you try sitting on an exercising ball instead of a chair? 10- Carry bags on your arms to allow the bigger muscles do their jobs. 11- Take Glucosamine supplements. Please refer to your doctor first.